The weather forecasters got their predictions wrong for this weekend. Heavy rain from yesterday lunchtime (it rained at 4pm) which would last until the early hours of Monday. It rained over-night but there's hardly been a drop since. Even our local WeBS organiser sent an advisory message out yesterday to recorders not to take risks in the weather. The only risk today came from wearing too many layers and over-heating. Light winds increased but it was 15 degrees C, dry, and quite pleasant. Perfect weather for WeBS counting. Whilst I was counting from the Budge screen, a couple arrived and we chatted about the long-billed dowitcher that has been at Cresswell (and briefly at Druridge...grrr) for the last few days. They told me the tale of seeing it two weeks ago on the Budge fields but weren't confident of the identification (they knew it was something different), so they didn't say anything. I encouraged them, that if they should find anything 'different' again, to let someone know. We all get things wrong, me especially, and we are always learning. That bird could have easily moved on and nobody would have seen it, let alone at Druridge. My disappointment was soon gone when I picked up a female merlin sat out on the Budge field, it seemed to pull apart some prey before flying over and landing on a post for a while. My first merlin at Druridge for a long while. Shortly after that a splendid short-eared owl put on a good show for us, quartering the fields in front of the hide. It was also right next to the path when I went to the Oddie hide - of course I had left my camera behind because of the forecast of rain. 29 whooper swan flew south. Four pochard were still on the big pool (I saw them yesterday). My first record of pochard this year, they are certainly very uncommon at Druridge nowadays. Yesterday I walked back along the beach, looking for snow buntings, which I didn't see. 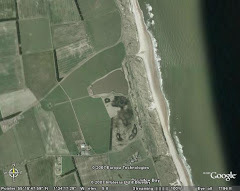 I did see a swallow though, a male, feeding over the dunes and beach. There were still plenty of insects about in this spell of warm weather. November 14th is very late for swallow and is my latest patch sighting. I have had a later 'Druridge Bay' record with one on 4th December many years ago, flying north at Chibburn Mouth. Pochard and merlin put me on 156 for the year, which is very disappointing. If I don't see anything else new, this will be my worst year on the patch since 2012 and my second-worst since 2005. There are still some possibilities - snow bunting, white-fronted goose, brent goose, black redstart, bullfinch, red-legged partridge...maybe even the dowitcher will come back. That would be nice! I was commenting to Heather this morning as we walked around the lake at DBCP about the lack of wildfowl. I know new wetlands have been created nearby but there were no Pochard, 7 Tufted Duck and only one Coot. Looking through my old notebook from January 1989 there were 344 Coot, 186 Tufted Ducks and 279 Pochard on Ladyburn lake! Me and another guy had the Black Tern that had been hanging around over the Budge field very briefly late morning on Thursday before it turned and headed back towards the pool at the west end but despite checking out the pool from the Oddie hide we never saw it again Iain.